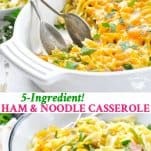 This 5-Ingredient Ham and Noodle Casserole is an easy one dish meal that takes advantage of your delicious leftovers! Thanks to Donna for sharing one of her family’s favorite dinner recipes with us! 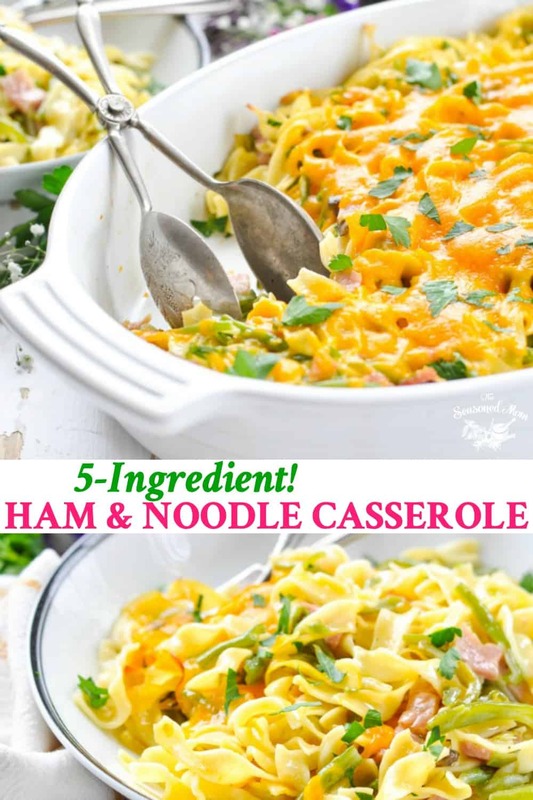 This 5-Ingredient Ham and Noodle Casserole is an easy one dish meal that takes advantage of your delicious leftovers! A reader named Donna participated in my free 5-Day Meal Planning Challenge last winter (you can sign up any time here), and she told me about this simple go-to meal that she often prepares with pantry staples when she doesn’t want to make a last-minute run to the grocery store. We’ve all been there, right?! 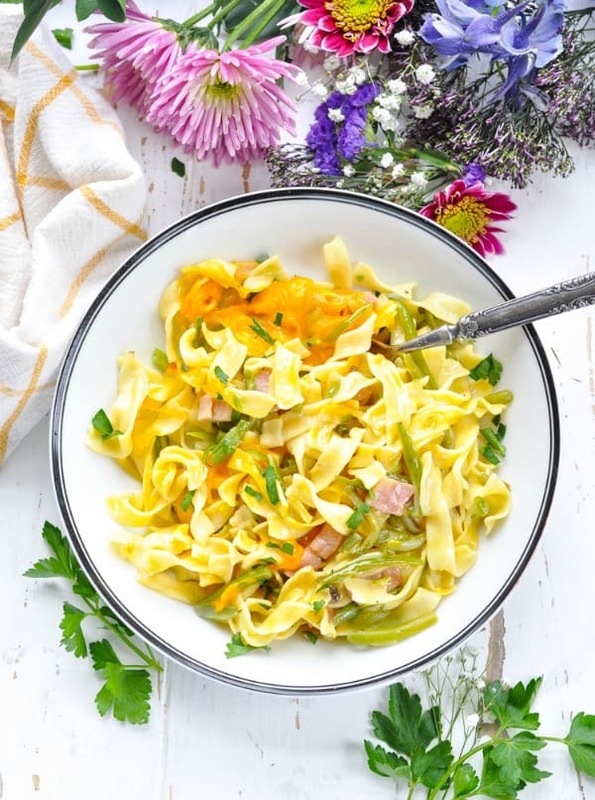 As soon as Donna sent me the recipe for her Ham and Noodle Casserole, I filed it away for spring — knowing that it would be the perfect way to use up the leftovers from our Easter ham. 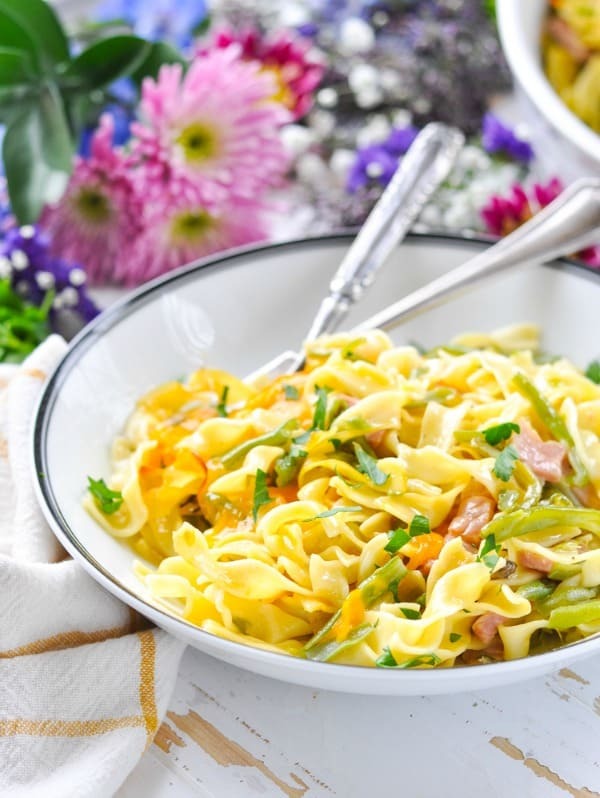 The creamy, light, and fresh pasta is truly perfect for the season! I’ve got good news: you don’t need to wait for Easter leftovers to enjoy this meal. This is one of those great dishes that comes together in just a few minutes and takes advantage of just about anything that you have on hand. Use it as a base and get creative — you can make the meal your own and tailor it to suit your family’s taste buds! Plus, you can add any vegetables that you like! Donna suggests frozen French-cut green beans, but peas, broccoli or anything else that you have on hand will work! Cook and drain the egg noodles according to the package instructions. While the noodles are boiling, place the mustard, ham, condensed soup, and optional vegetables in a large bowl. Add the hot noodles to the bowl and toss to combine. Transfer the noodle mixture to a large baking dish and top with grated cheese. Cover with foil and bake at 350 degrees F for 20 minutes. Then remove the foil and return the casserole to the oven (uncovered) for another 20-25 minutes. That’s it! 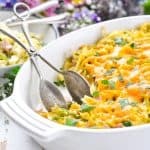 Can I make Ham and Noodle Casserole in advance? Yes! This recipe can be assembled in advance and refrigerated until you’re ready to bake it. Use any type of meat that you prefer. From chopped ham to sausage, bacon, chicken, or beef — it will work with just about anything that you have. If you want to use ham, but you don’t have leftovers from a previous meal, you can purchase sliced ham at the deli counter or you can dice up a “ham steak” from the meat section at the grocery store. Donna uses Cream of Mushroom soup, but she suggested that Cream of Chicken soup, Cream of Bacon soup, or Cream of Celery soup would all be great substitutes. The base recipe that Donna gave me does not include green beans. However, she said that she recently added 4 cups of frozen French-cut green beans to the dish and it worked nicely. I included the green beans as an optional ingredient here, but you can substitute frozen peas, regular cut green beans, asparagus, broccoli, sliced mushrooms, or just about any other veggie that your family loves (or leave them out entirely and just serve a salad on the side). I tried the recipe with the French-cut green beans for these photos and it worked really well! Such an easy way to get more vegetables into my family’s bodies in a relatively undetectable way. The thinly-sliced green beans just kind of blend right in with the pasta! Donna’s recipe only calls for one small can of the condensed soup. The end result is a light, slightly creamy casserole — but there’s no thick sauce. If you want more cream sauce in your finished dish, I would suggest using two cans of condensed soup and thinning with a bit of milk. Donna lives in a household with just 2 people, so she often divides the leftovers into individual portions and freezes them for later meals. And there you have it! 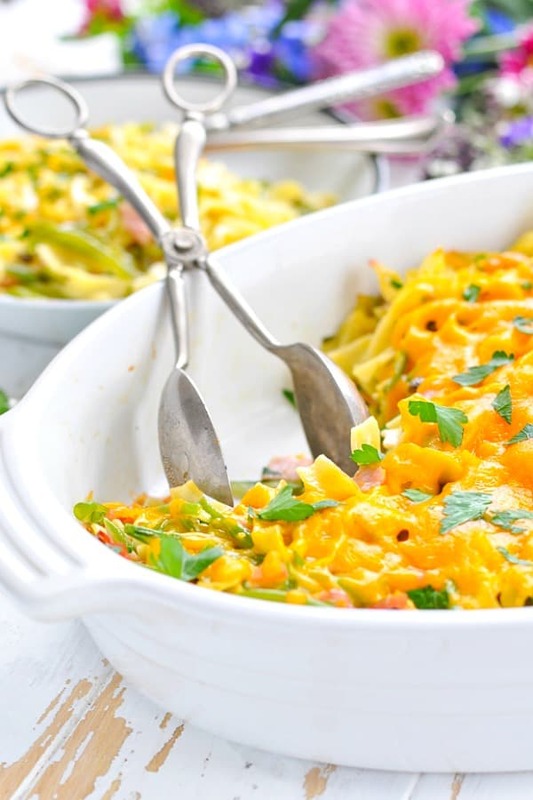 A simple and delicious 5-ingredient casserole that will take advantage of any ingredients that you have on hand (and will help you avoid another grocery run)! Enjoy! Preheat oven to 350 degrees F. Spray a 9 x 13-inch baking dish with cooking spray and set aside. Cook egg noodles just until al dente, according to package instructions. Drain. While the noodles are cooking, place mustard, ham, condensed soup, and optional frozen green beans in a large bowl. Pour the drained, cooked, hot noodles over the rest of the ingredients in the bowl and stir to combine. Transfer noodle mixture to prepared baking dish. Top with grated cheese. Remove foil, return to the oven (uncovered) for 20-25 more minutes, or until cheese is melted and casserole is heated through. Note: This casserole can be prepared in advance and kept in the refrigerator overnight until ready to bake. Note: The leftovers can be frozen in individual portions and reheated, as necessary. Cooking Just for Two? 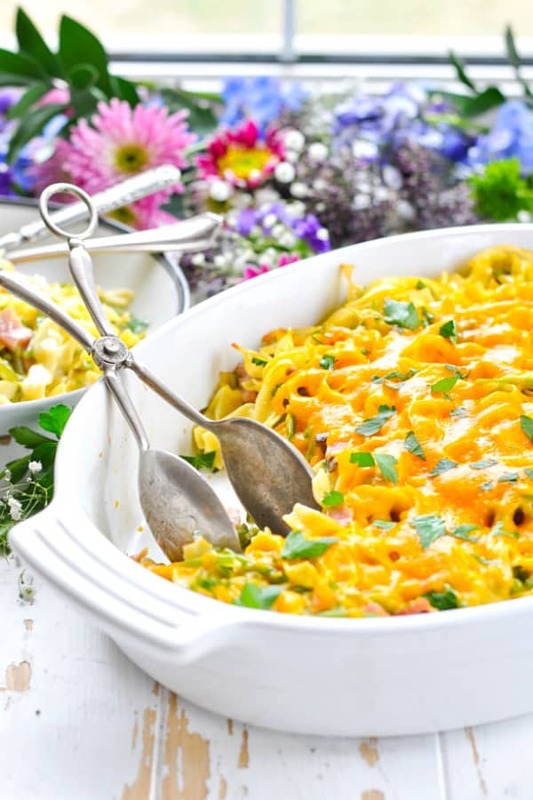 If you prefer to have fewer leftovers, you can cut all of the ingredients in half and prepare the casserole in an 8-inch square baking dish. The cooking instructions remain the same. Use any type of meat that you prefer. From chopped ham to sausage, bacon, chicken, or beef -- it will work with just about anything that you have. If you want to use ham, but you don't have leftovers from a previous meal, you can purchase sliced ham at the deli counter or you can dice up a "ham steak" from the meat section at the grocery store. I tried the recipe with the French-cut green beans for these photos and it worked really well! Such an easy way to get more vegetables into my family's bodies in a relatively undetectable way. The thinly-sliced green beans just kind of blend right in with the pasta! Donna's recipe only calls for one small can of the condensed soup. The end result is a light, slightly creamy casserole -- but there's no thick sauce. If you want more cream sauce in your finished dish, I would suggest using two cans of condensed soup and thinning with a bit of milk. This is such a quick and easy weeknight meal! I’m going to have to try this the next time I make my homemade cream of mushroom soup! Awesome! I hope you’ll try it, Dee! My daughter loves casserole. Definitely gonna give this one a try soon, hope it will be tasty for her. Thanks for the recipe. Hi, Kimberly! Casseroles are so kid-friendly! I hope that you daughter loves it! Blair: this sounds soo good, quick and easy peasy; thank you for sharing. 🙂 Going to try this very soon, as we eat a great deal of chicken and thinking of giving it a try after first time of using ham. Hoping you have a great day, love your recipes. Hi, La Juana! Thanks for your note! I hope that you enjoy the casserole! It’s definitely a great easy option. Have a wonderful weekend! Awesome! You’re so creative, and your changes sound delicious! Thank you! Original recipe is great too. I just wanted to use up all my perishable items. Easy and excellent! I used Swiss cheese, added a cup to the casserole as well as topping it. Had about of cup of leftover Alfredo sauce that I added too. Got thumbs up from my husband and teenage grandson. Wonderful! Your version sounds delicious, Cheryl! Great recipe! I improvised. I used fresh mushrooms, carrots, peas, ham, bow tie pasta, cream of potato soup, onion powder, garlic powder, and Tony Chachere’s. I used a mix of shredded cheddar and mozzarella. I had to cook it a little longer because of the carrots. I topped it off with my own crushed homemade croutons. It was fabulous for a quick throw together supper!! This sounds great! Can it be done with Gluten Free noodles/pasta? I made the exact recipe, and included the green beans. It was really bland. It tastes as if it’s missing something.